With the aid of our deft personnel, we have been able to come up with a vast gamut of Refrigeration control panels. All our Industrial Refrigeration Control Panels are well developed as per the guidance of experienced quality inspectors in sync with international norms, hence assured of flawlessness. 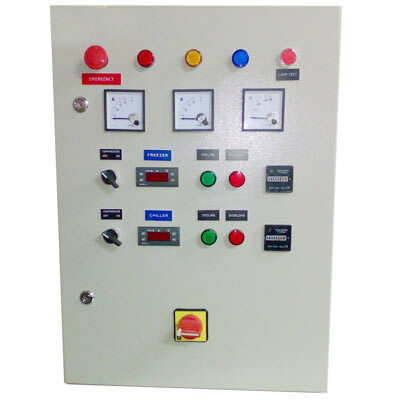 These panels are widely used in varied industries. Made using good quality raw material such as ABB, Siemens, Snider, and L&T and modern machines by following internationals and quality standards, this range is assured for a reliable performance. Also, this range can be designed as per the requirements of our esteemed clients and is available in different models, AMPS, and KVA rates. Widely acknowledged for their technical effectiveness, efficiency, smooth operation and reliability, our quality range of Refrigeration Parts Thermostat Control Panels has made us win huge accolades all over the domain.